California water quality regulators are investigating an incident in San Anselmo on Sunday that caused at least 100,000 gallons of raw sewage to spill out of manholes in the city. 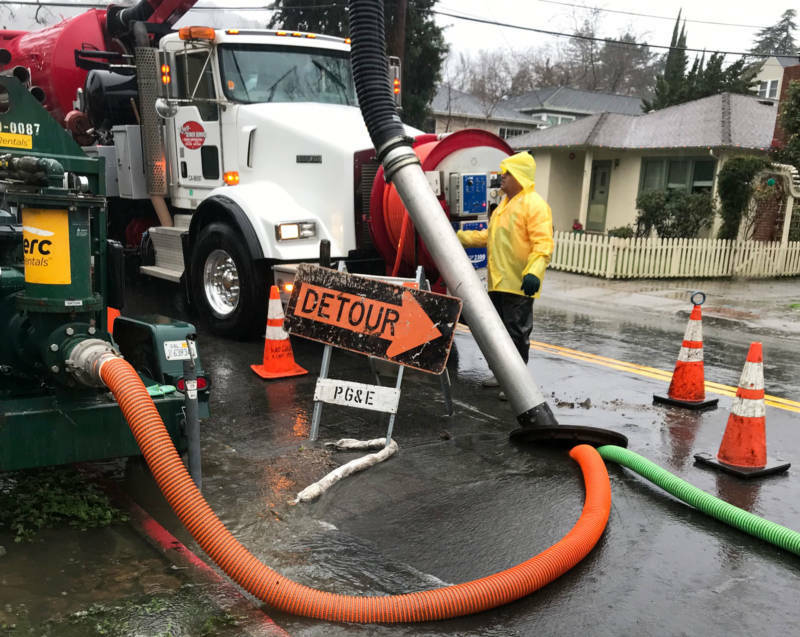 The spill took place during a rainstorm that overwhelmed a Ross Valley Sanitary District sewer improvement project, sending sewage onto portions of Sir Francis Drake Boulevard, Broadmoor Avenue and Morningside Drive. "It was an avoidable spill," said the agency's general manager, Steve Moore, in an interview Tuesday. "It's unacceptable because of the risks to public health and the environment." The district has been in the process of replacing a series of century-old pipes. When rain was in the forecast for Sunday, construction crews worked to set up a bypass to divert stormwater around the replacement project. "The bypass system that was placed over the weekend was inadequate to convey the storm-swollen sewer flows around the project site," Moore said. Sanitation crews worked to contain the spill, which was first reported by the Marin Independent Journal. They used vacuum and tanker trucks to recover the sewage. The agency notified the California Office of Emergency Services, initially believing 25,000 gallons of sewage had spilled. On Monday afternoon, the district told state officials there were actually two releases and that more than 50,000 gallons had spilled. On Tuesday, Moore's office doubled that estimate. And the agency believes those measurements will increase. "The spill amount is expected to rise after the videos are looked at," the district wrote in a report filed with state water regulators on Tuesday. That report also revealed that the spill lasted around 12 hours, starting at 12:40 p.m. on Sunday and ending just before 1 a.m. Monday. A representative for the San Francisco Bay Regional Water Quality Control Board confirmed Tuesday that it was investigating the spill. Moore said his agency failed to plan well enough for Sunday's rain. "It's part of our standard protocol to make sure that we're prepared," he said. "We fell short of that standard this weekend." On Sunday, San Anselmo received more than 3.7 inches of rain. Over the weekend, around 5.6 inches fell on the city, making it among the highest rainfall amounts in the Bay Area during that time period, according to Steve Anderson, a meteorologist with the National Weather Service. "There was an extraordinary storm this Sunday," Moore said. "It was larger than predicted and it was especially intense. It was one of those rain bombs," he said. Sanitation district officials believe the sewage flowed out of manholes and into street gutters. which drain into the San Anselmo and Corte Madera creeks, and eventually San Francisco Bay. The spill prompted Marin County officials to post more than 10 signs along Sleepy Hollow Creek, which leads to San Anselmo Creek, cautioning people to not go into the water because of the contamination, according to Rebecca Ng, deputy director of the county's environmental health services. The county is also testing water samples from local creeks for bacterial counts, Ng said in an email. Results from those tests are expected at the end of the week. San Anselmo has had a history of flooding, and the Ross Valley Sanitary District is one of the oldest such districts in California. "Over time it becomes leaky and prone to infiltration of stormwater," Moore said of the agency's system. The ongoing sewer replacement project is designed to prevent the very type of spill that took place on Sunday, he emphasized. A spokesman for the project's contractor group, Maggiora & Ghilotti Inc., did not respond to a request for comment. The sewer work is slated to be completed Jan. 18.